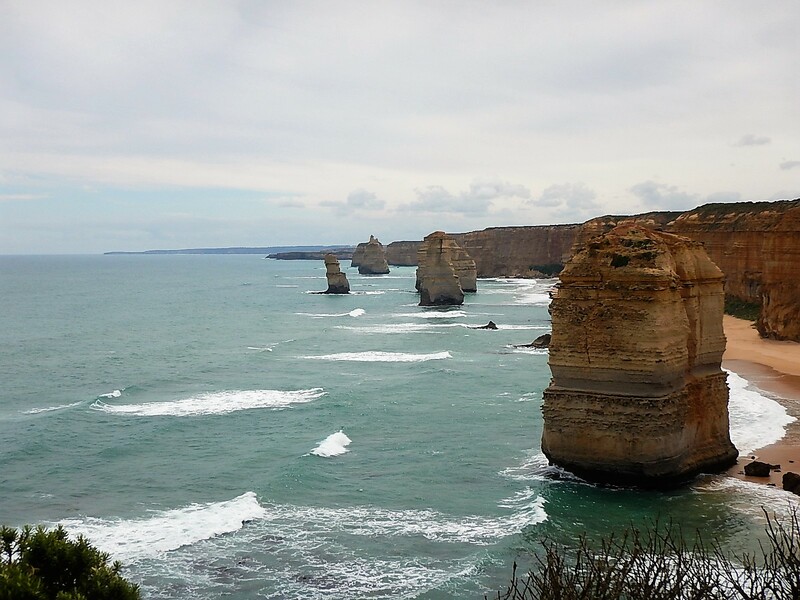 The Great Ocean Road runs along the south coast from Geelong, south of Melbourne towards Adelaide, the total journey between the two cities is just over 1000km and the Great Ocean Road (GOR) extends for about half of it. The road is famous as a scenic route and in particular for a stretch of limestone coast with a series of rock formations known as the Twelve Apostles, although thanks to continuing erosion there are only nine now! We left Melbourne driving through the western suburbs and turned south to the coast, we kept going until we reached the start of the GOR then stopped for coffee on the cliff top in Torquay (or Talk Way as the satnav pronounced it). From there we drove along the coast to Apollo Bay where we were staying for one night. Once we had checked in we went for a walk through town and then down to the beach, we walked along to the marina wall and back, past the golf course and into town. It was lovely to be by the sea again and the weather was sunny and warm. Apollo Bay is a small holiday town with a couple of cafes and fish and chip shops and a pub; the hotel had suggested an Italian restaurant opposite the carpark entrance so, figuring it would be convenient we went there for dinner. We were very pleasantly surprised, we shared an antipasti platter to start, it had lots of local produce, salami, cheese, olives, dips and sourdough toast, Mark had the seafood linguine (Apollo Bay is well known for seafood apparently) and I had chicken risotto, both were excellent. Next morning, we decide to set off and stop for breakfast further along the coast, it was the day that 4000 riders on the Great Ocean Ride were completing the stage from Port Campbell to Apollo Bay, fortunately we were heading in the opposite direction to them so although we saw a steady stream of riders through the day we didn’t get caught up with them. Villages are few and far between along the GOR but we had been told to look out for a stop in a place called Lavers Hill, sure enough we found a little garage/café/shop sitting right on the junction where marshals were directing cyclists towards Apollo Bay, it didn’t look very inviting but ‘what the hell’ we went in and ordered coffee and two cooked breakfasts, the waitress pointed to the café area and suggested we sit down and she would bring the food over when it was ready. 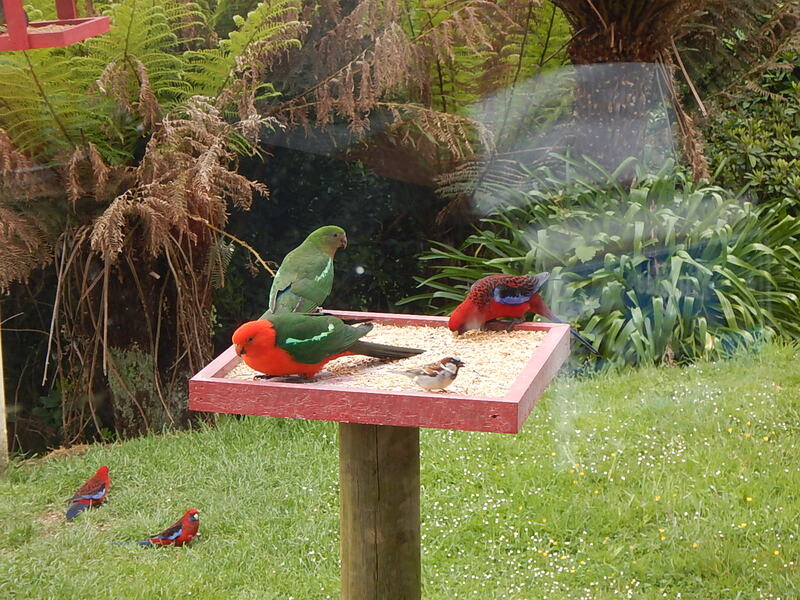 We walked over to the tables in front of a picture window, when we looked out there was a garden with three bird tables covered in beautiful brightly coloured parrots! We enjoyed watching them come and go and fighting for a place on the bird tables, there were several types of parrot and there was definitely a hierarchy in play. After a while breakfast arrived and it was very good, we were so pleased we stopped. As we left we stopped to speak to a teacher who was leading a group of school kids on the ride, he and Mark compared experiences and he was interested to hear about the rides Mark organised in Normandy for kids from St Bede’s. After breakfast we took a detour further inland to visit the Otway Fly Tree Top Adventure, Otway is a National Park containing a rare stretch of rain forest in South East Victoria, near Lavers Hill there is a 600m treetop walk along a gantry through the rainforest canopy about 25m above ground. It was interesting and very quiet, it is a popular tourist attraction but that day we had it to ourselves. Next stop was the stretch of coast with the Twelve Apostles. There is an official Twelve Apostles Visitors Centre with walks along the clifftop giving great views of the rocks, however Terry had told us about The Gibson Steps about 1km before the visitor centre, the steps lead down to the beach and give a different view of the rocks so we stopped there first. It was quite a long way down to the beach but it was well worth it, we made sure we got the full experience by stopping at the visitor centre too. From there we stopped at several smaller viewpoints to see different rock formations and costal features, one of them, Loch Ard Gorge was particularly impressive. We reached our next stop, Port Fairy at about 5pm. Port Fairy was a lovely little town with some quite upmarket shops and restaurants, we stopped at a Chinese restaurant and had the special set menu then headed back to the hotel for the evening. We didn’t want to leave Port Fairy without having a look around so before we left we drove down to the quay and walked out to the historic lighthouse on the headland, it was a lovely walk and it was nice to get some fresh air and stretch our legs before the 270km drive to our next stop, Robe. On the way to Robe we stopped in a town called Mount Gambier to see the Blue Lake, a flooded volcanic crater which is grey during the winter but every November turns vivid blue. Mark took a photo looking down from the crater rim to the water reflecting the clouds, if you look at it below it looks like the photo was shot looking up a bank to the sky!! The drive to Robe also took us across the state boarder into South Australia, we had to adjust our watches to the local time zone which is 30 minutes behind of Victoria, I’m not sure how that works but so be it! Robe was another nice little town with a marina and a lovely walk around a headland with views across the bay, after a day in the car we were glad to walk to the lighthouse, two in one day! Acting on another hotel recommendation we headed to the pub for dinner and treated ourselves to the seafood platter which came with oysters, mussels, scallops, king prawns, grilled fillets of fish and deep fried fillets and chips, we washed it down with some Australian cider, delicious. The last stretch of the journey to Adelaide was the longest, 334 km with just one service station along the first 200km. We filled up with petrol and set out, this stretch was less scenic but it did take us through long stretches of bush (watching out for Kangaroos) and passed huge lagoons and salt pans. We made it to the town of Meningie, stopped for coffee then pushed on to Adelaide, we had a deadline to return the car by 4pm. We made good time and were able to drop the bags of at our hotel before we returned the car. Mission accomplished we walked back through the centre of Adelaide getting our bearings and stopping for a glass of wine and a beer on a balcony overlooking one of the main streets. Once again we are staying near an excellent market so we stopped in to buy bread and cheese and fruit for supper. The journey from Melbourne to Adelaide was over 1000 kms, it was a great drive across new territory, a proper Australian road trip. We did the GOR but did not went beyond. Would sure like to drive all the way to Adelaide!